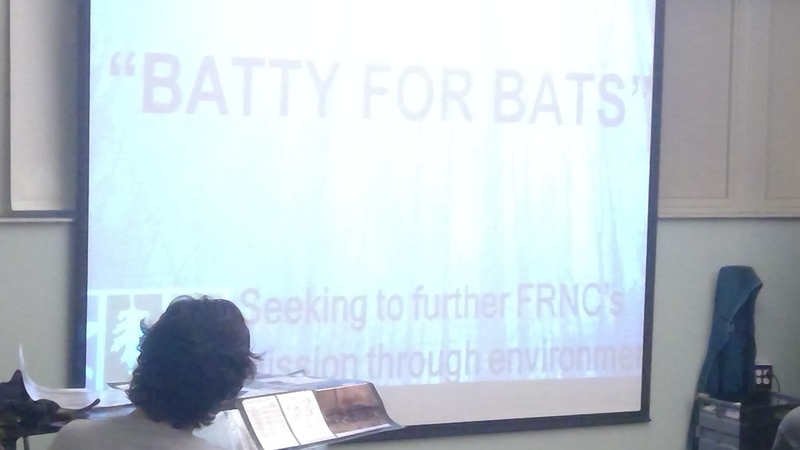 Batty for Bats – No, Really! 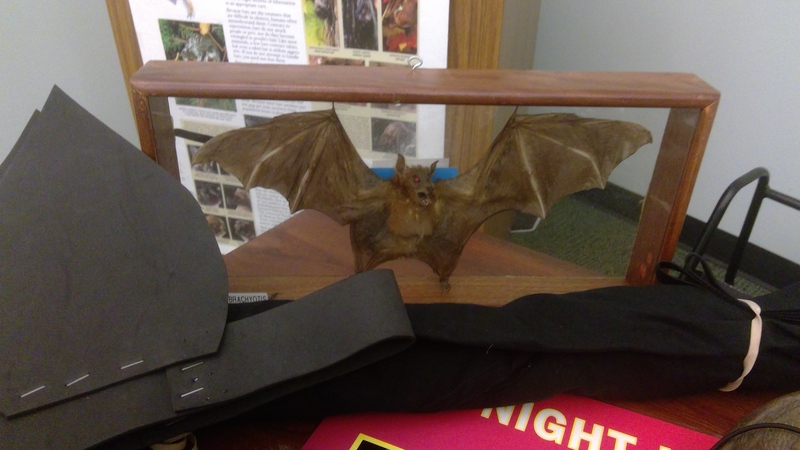 I knew I couldn’t stay for the whole program, but when the Free Public Library of Monroe Township posted about a special presentation called Batty for Bats, well I knew I had to take a gander! Ms. Mary, a naturalist from the Rancocas Nature Center, 794 Rancocas Road, Westhampton, NJ 08060, quizzed local children at the library on what they knew about bats and tested them with some true or false statements. When I asked Ms. Mary if the kids attending these programs were usually creeped out, she said that the snakes and reptiles were actually quite popular – and the youths tonight agreed that bats were “cool.” After all, bats groom themselves just like cats do! The children – and let’s be honest the parents there, too – were curious to see some of the bat materials on display. Facts on bats such as wing span and heartbeats per minute were hit home for the kids by donning some costume wings to test their own wing spans and putting on stethoscopes to hear their own heartbeats in a “How a Bat Compares to Me” activity. 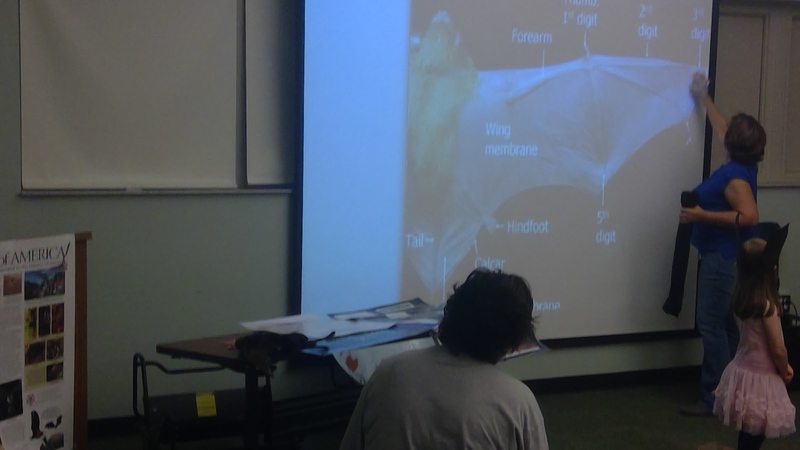 Everyone had a good laugh while learning the basics about bats from Ms. Mary – who confessed to not actually being a bat expert because she prefers bugs. Based in Burlington County within the 200 acre Rancocas Park and formerly part of the New Jersey Audubon Society, The Rancocas Nature Center puts on a variety of nature and educational programs in South Jersey. For more information, visit rancocasnaturecenter.org or follow facebook.com/FriendsofRNC to support their programs. And no, there are no vampire bats in New Jersey, thanks for asking. A very special Thank You to Ms. Mary, the Rancocas Nature Center, and the Monroe Library for allowing me to stop by the program and take a few pictures!